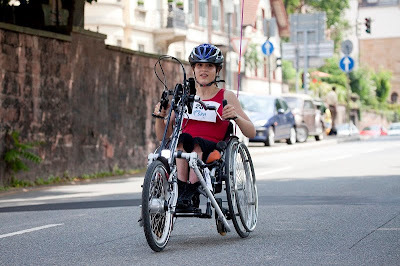 The Heidelberg International Wheelchair Marathon will be an autumn race this year – the start will be moved from the traditional date in summer to Sunday 9th October 2011 (11.00 am-Marathon Start, 9am Welcome Address). The reason for the delay is that parts of the course are still under construction. Where the diggers are working at the moment, the fastest hand-bikers will be speeding between Heidelberg and Neckargemünd this year. The round course (44 km) can only be opened for the athletes after completion of the road construction. The course remains the same. Start and Finish will be on the banks of the river Neckar, the distance will be 44 km, the same as in the past years, including time measurement at the marathon point 42.195 km. 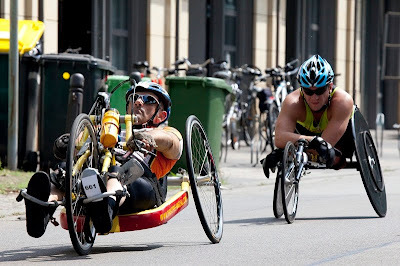 Many hundred sports people are expected again, hand-biker, sports people in their racing bikes, children and youths (“Mobifant Cup”) and everyday sports people. They are especially invited this year: The Heidelberg Wheelchair Marathon does not only want to present only top sport (the race is part of the Handbike-City-Trophy) but also wants to attract many hobby sportsmen. 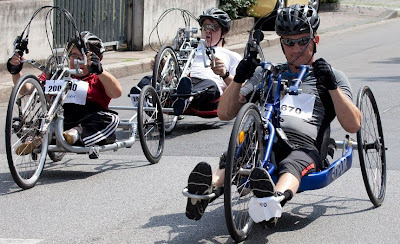 Add-on-bikes can be found in the garage of nearly everybody in a wheelchair, and with this sport equipment it is very inviting to take part in the half marathon on the flat course along the river Neckar. The organizing team with their new chairman of the “Heidelberg Wheelchair Marathon e.V.” Joachim Schermuly would like to more than double the number of add-on-bikes which was 18 in 2009. The aim is 50 athletes in this racing class. 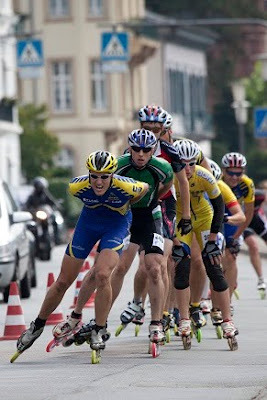 Inline skaters will also be at the start in October, the organizer hope to have dry weather and rapid overtaking maneuvers. Around the race there will be an extensive program – with live music, information and the traditional noodle party. In this respect everything is prepared for the 11th Wheelchair Marathon and – who knows – maybe also for a new course and world record. After all, in October the asphalt will in parts be as smooth as never before – the road construction works which will be finished by then will make it possible! More information, the invitation and the registration for can be found on the internet at the official website for the Wheelchair Marathon of Heidelberg. Gene: When was the first Marathon? Is there a Marathon every year? Gene: How interenational is the Marathon? From which countries do you expect participants? 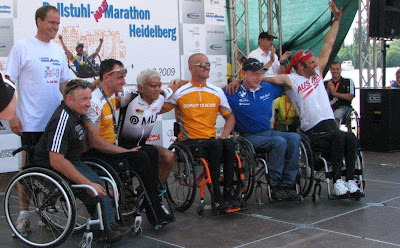 Matthias: The Marathon really is internationl - every year we get participants from all over Europe (The Netherlands, Switzerland, Austria, Italy, Sweden, Russia, Czech Republic, Poland etc), and also overseas (including America, Japan, Algeria, etc). I can not say from what countries participants will come from this year, because the registration is ongoing. Gene: Are there people who speak English in the organization? Is the organization prepared to communicate with the foreign participants? Matthias: We have members who speak fluent English and French. So communication with the participants will not be a problem. Gene: How much does it cost to participate?